Why Are Registration Forms on Gaming Sites So Poor? In my first post on optimising gambling sites I covered the psychology behind using bonuses as an acquisition tool. In this post you will learn about the challenges of optimising account creation and registration forms. Registration forms for gambling sites are mandatory to ensure players meet minimum age and to avoid money laundering and fraud. But because gambling is regulated very differently from one country to another the registration process is neither a uniform or a simple process for most customers. In highly regulated countries such as Spain and Italy the content of the sign up form is practically prescribed by the regulators and the customer has to provide their ID number to verify their identify. This does present certain challenges, but as with any form, friction can be reduced through evaluating web form design best practices. This includes data capture strategies (e.g. auto-population of fields according previously completed field) and eliminating non-mandatory fields. For this post I concentrate on the UK market as it is one the most competitive and innovative markets in the world. Regulation of the online gambling market in the UK is also less prescriptive and so there is plenty of scope to improve the account creation process. What is the user’s goal? 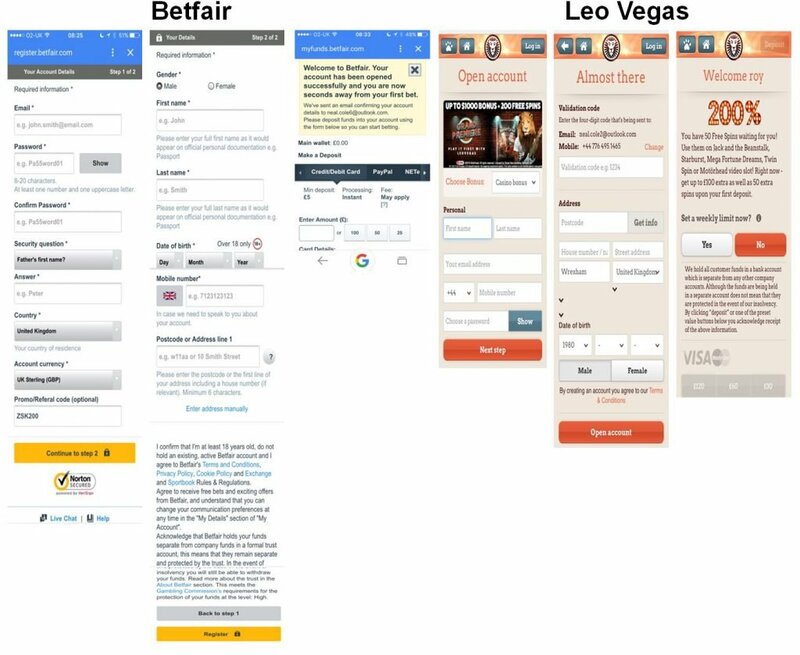 Most sites and apps have two or three step registration forms such as those shown below from Betfair and Leo Vegas. As you can see these can be long and complex forms. This may be a mistake as rather than focusing on the user’s goal of account creation registration forms are designed from the brand’s perspective. They try to encourage or force customers to make a first-time deposit before customers can check out the product. The danger here is that many users may not be in the right frame of mind to complete two tasks. They might just want to create an account so that they can first check out the games or the design of the user interface for poker games before committing to making a deposit. By asking for so much information to create an account there is a danger that users may feel the site is making too many assumptions about why they want to create an account. They may not yet trust the brand enough to provide so much personal information. This approach to registration forms could significantly reduce your conversion rate. A better strategy may be to allow users to create an account with minimal information and then give them the option to make a deposit. This requires much less personal information for account creation as most of this only needs to be collected when the customer wants to make a first-time deposit and become a real-money player. Amazingly very few brands use this approach. This could be because the majority of people like to follow the herd. It’s safer and technically easier as most back end systems have been set up this way. When you suggest this approach you either get told by Compliance that it would not be allowed or developers come up with a multitude of reasons why it would be difficult to implement. Basically, it would be hard work! Poker Stars does use this approach and are market leaders for online poker. They have reduced the number of questions to just five fields compared to well over 10 fields for most registration forms. They have further simplified the process by dedicated each screen of the sign up process to a single question. This works because people prefer to focus on one task at a time and we are generally crap at multitasking. Usability studies by the UK government’s user research team also found this was the preferred option for most users. For many gambling sites a username rather than an email address is required for account creation due to legacy systems. However, the setting up of a username makes little sense in casino and sports sites where there is no direct competition between players. Even for poker and bingo sites this could be set after account creation to reduce friction in the registration process. 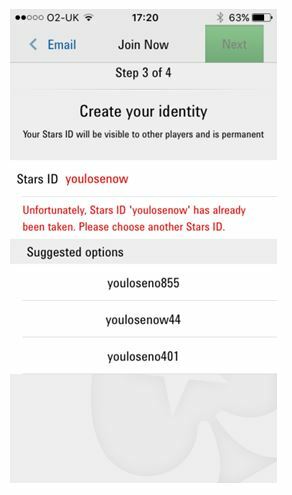 Apart from the issue of forgetting your username, the main concern here is the “Username already in use” error message that many players will see because their preferred option is already taken. This can be a serious pain point for established brands where most common usernames are already in use. Letting customers sign in with their email address rather than having to enter a username would eliminate this problem. If your brand forces customers to set a username ensure your registration forms automatically suggests alternative usernames when a player gets the “Username is already taken” error message. Some brands have considered automatically allocating a username in the back-end to allow customers to sign-up with their email address. However, I’m not aware of any company to successfully implement this solution as it could create other IT and security issues. Set a cookie to remember a player’s username in the login screen for existing customers as customers often have different usernames for each of the sites they sign up on. 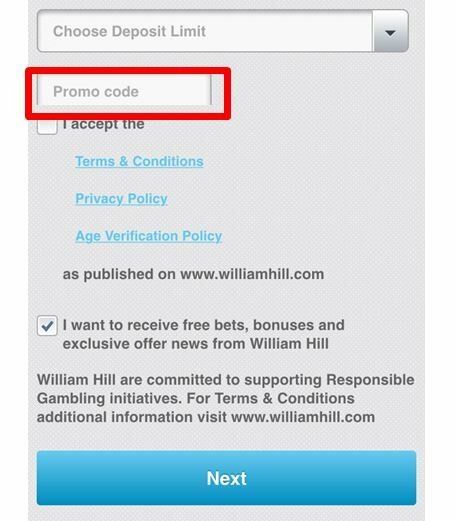 Many gambling brands persist with including a bonus code in their registration forms. These just encourage customers to go looking for a code if they don’t have one already. If you are going to have a bonus code field make sure it is pre-filled so that users understand they will automatically get a bonus. Otherwise remove the field and inform customers that a bonus will be applied automatically. Web form design best practices can help identify many ways to improve the conversion rate of your registration forms, but best practice doesn’t always work because each site is unique and context is extremely important. Instead you should consider regularly conducting face-to-face usability research or you can use remote user testing tools if you prefer. Ensure you observe how people interact with the user interface rather than asking direct questions which force people to post-rationalise their behaviour. If you are designing a totally new form then you could consider a Google 5 day design sprint to allow for rapid prototyping and user testing. This allows you to bring together a group of experts and stakeholders to develop and test a form within 5 working days. Form analytics provide detailed metrics on how users interact with your form. A good form analytics solution will measure how long it takes users to complete each field, which fields they miss, when they do or do not use auto-complete and which fields correspond with form abandonment. Formisimo is a dedicated form analytics tool and is highly regarded by many conversion rate optimisation consultants as most other products are add-ons to web analytics software. 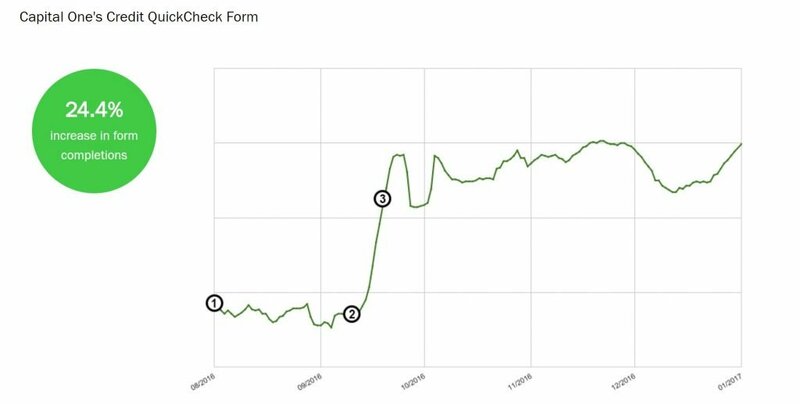 The chart above tracks the form completion rate for Capital One’s Credit QuickCheck form over a five-month period. Point (1) shows the start of the project, where (2) is the first stage of changes being made and (3) is a further round of changes. Over the 5-month period the conversion rate of the form increased by 24.4%. If your registration forms have sufficient traffic you should integrate an appropriate A/B testing tool. These allow you to change elements of your form design without having to build a new form and then test it using a controlled experiment. Often this involves making a single change at a time to see what impact this has on conversion. However, sometimes you may need to fix multiple problems to prevent obvious defects over-powering small improvements. 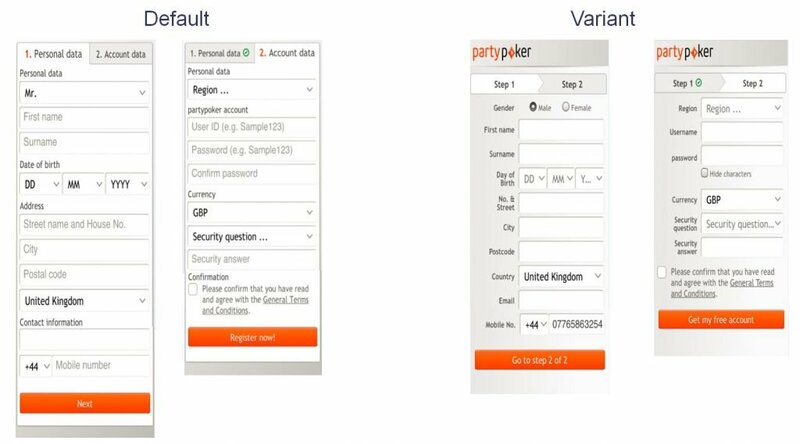 With this partypoker registration form we realised that it suffered from many different problems including the field labels being used as placeholder text, no brand logo, ambiguous call-to-action text and repeated fields. By fixing all these problems at one time (see Variant) we hoped for a more substantial improvement in form completion. Indeed, we saw a 6% uplift in the form conversion rate. You can always go back and test removing individual changes to measure if they had a positive impact on conversion, but at least you will have made a significant improvement with your first test. Following the herd is not always the best way to arrive at a decision. For gambling sites this has prevented the application of user-centred design in an important area of customer acquisition. Companies are too heavily influenced by internal systems and what their competitors are doing rather than looking at the account opening process from the customer’s perspective. 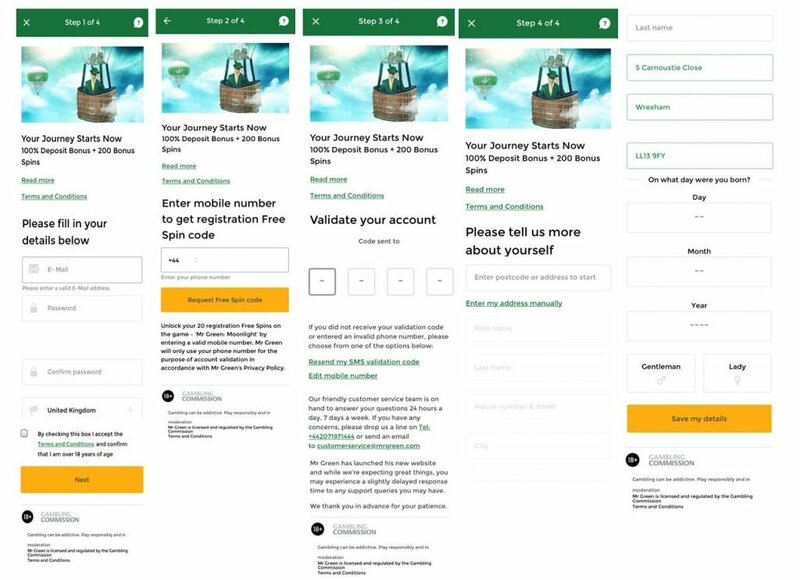 To optimise conversion it’s important to keep an open mind and use data and experiments to inform decisions about the design of your registration form.